Dr. Alexander Angelov, MD, of Swampscott, MA, in his office, with Susanna Bair, President of iamHeart. 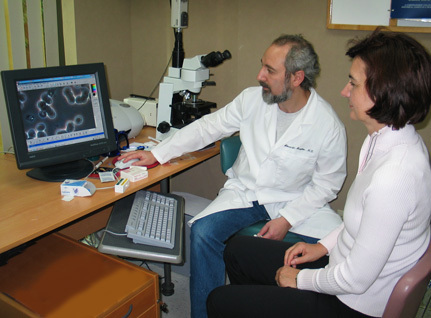 Using a high-resolution photo-microscope attached to a digital video camera and computer, Dr. Angelov is able to examine the clumping of red blood cells, an indication of stress.Red blood cells normally repel each other because the membrane of each cell has a slight electrical charge of the same polarity. 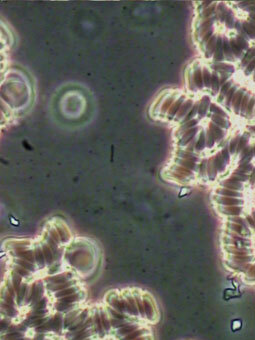 When the cells lose that charge under stress, the red blood cells stick together instead of floating separately. 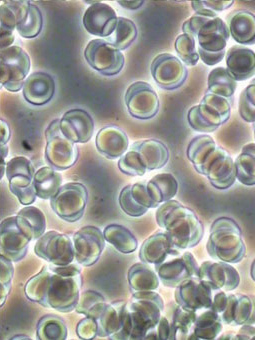 Under stress, when energy is needed most, the blood goes into a condition, agglutination, which causes an anemia that actually reduces energy in the body. This is not a "fight or flight" response; it does not provide the energy to flee. Instead it is an energy strike that attempts to stop one from creating more of their own stress. With Heart Rhythm Meditation (HRM), one can endure stress and still operate in a healthy condition.